Home › Home and Kitchen › Bobucuisines One-Piece Super Ice Cream Scoop - Unbendable For The Hardest Ice..
Bobucuisines One-Piece Super Ice Cream Scoop - Unbendable For The Hardest Ice..
bobuCuisines One-piece Super Ice Cream Scoop - Unbendable for the Hardest Ice Cream - Modern, Stylish Design, Non-slip Rubber Grip Dishwasher Safe - Rock Your Kitchen with Your New Super Scoop! SOLID, STURDY & UNBENDABLE for the hardest ice creams. Our scoop wont bend when used on hard frozen ice cream. IDEAL for your gelato or frozen yogurt. The perfect scoop. Enjoy delicious ice cream, sorbet, or Italian ice straight from the freezer! This scoop glides through hard frozen desserts like butter. CLASSY & CHIC: Its black and silver chrome plated finish gives the scoop an incredible & unique look that will steal the spotlight. Its not just stunning, the scoop is super tough and virtually indestructible. The elegant packaging and super scoop makes for a perfect stocking stuffer, Christmas gift, or birthday gift for him or her! ERGONOMIC HANDLE: Lets you easily scoop out whatever ice cream you like with minimal effort. No more digging or waiting for ice cream to thaw. Easy on your hands and wrists and helps you avoid muscle strain. SMART DESIGN: Pointed tip easily scoops even the hardest ice cream, while the flat edges can reach into the corners of ice cream containers. A non-slip grip makes usage comfortable even with repetitive scooping. INCLUDES DELICIOUS RECIPES - We show you how to make 10 different types of tasty frozen treats. Weve created some to-die-for recipes of ice cream, handcrafted by us here at bobuCuisine. Youll discover the convenience of creating delicious desserts in the comfort of your own home! Comes FREE with your purchase. LIFETIME WARRANTY, we know this scoop is awesome and we back that up. ORDER NOW WITH NO RISK - If you're not happy with your ice cream scoop or any of our bobuCuisine products, neither are we - and that's why we offer a No Questions Asked Money Back Guarantee. Order today. See more product description below for added information. Welcome to bobuCuisine! bobuCusine is an innovative kitchenware brand that prides itself on producingstunning products and providing an amazing buying experience. Moving out? New condo? New space? Let us rock your kitchen with our awesomenew products! QUITE SIMPLY, YOUR NEW SCOOP IS THE HOTTEST, COOLEST AND TOUGHEST ICE CREAM SCOOP YOU'LL FIND, PERIOD! GET READY FOR YOUR SCOOP TO STEAL THE SPOTLIGHT! Not only is the scoop super chic with an awesome design, it's the toughest available. It is unbendable no matter how hard the ice cream. The beautiful look will be a hot addition to your kitchen. It's perfect for all your favorites: Hagen-Dazs, Ben and Jerrys and many others. Its Chrome Plated Finish gives it a unique style and sophistication Looks incredible on your countertop. This will quickly become your favorite ice cream scoop ever. This Ice Cream Scoop is easy to use and they make an awesome, affordable gift for any occasion, including housewarming parties! Makes for a great Christmas gift and stocking stuffer. A non-slip grip cushions your hands during scooping. The handle is made from a thermoplastic elastomer rubber that's BPA-free and food-safe. It's soft to the touch, but allows for a firm grip. Our scoop won't slip or put undue stress on your hands and wrist. Use it over and over for years with the same dependable results. LIFETIME GUARANTEE, ORDER WITH TOTAL CONFIDENCE bobuCuisine products feature clever ergonomic designs and chic, gorgeousfinishes. Our rock-solid guarantee means we'll replace your scoop if there's ever aproblem. We've got your back! 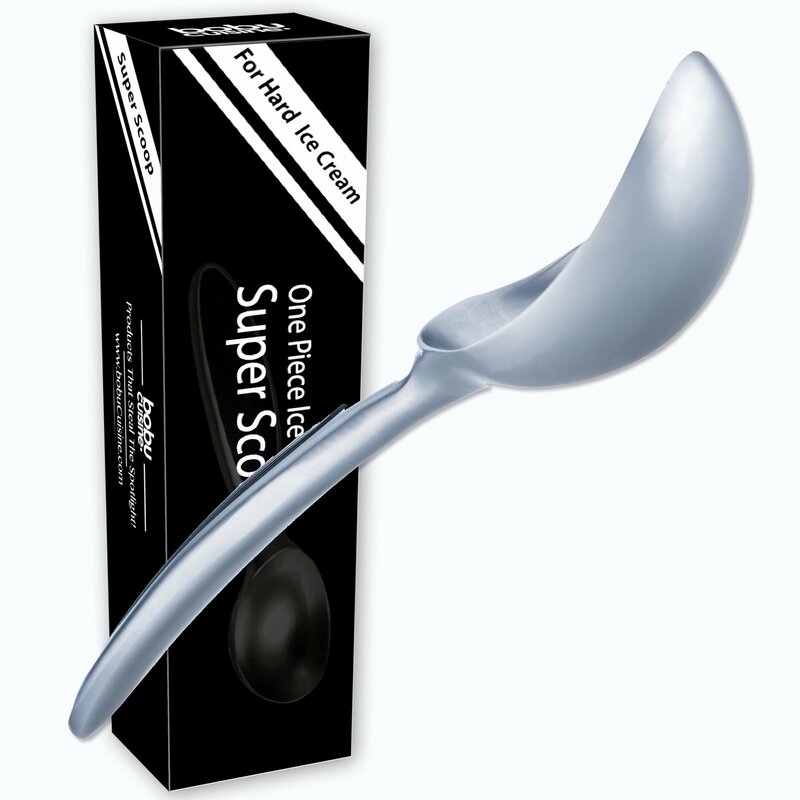 ORDER YOUR NEW ICE CREAM SUPER SCOOP TODAY!